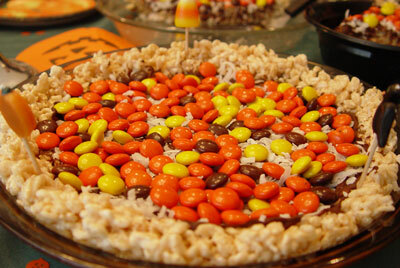 A colorful Halloween version of Rice Krispy Treats! Grease two 9- inch pie plates with butter or spray with nonstick cooking spray. In microwave safe bowl, heat the 1/4 cup butter and marshmallows on HIGH for one minute; stir until marshmallows are melted. Add the cereal; mix well. Press onto the bottom and up the sides of the greased pie plates. In a heavy saucepan, melt chocolate chips; stir until smooth. Spread over prepared crusts. Stir coconut and peanut butter candy pieces together and sprinkle over melted chocolate. Press down to imbed into the cereal crust. Let stand until chocolate is set. Cut each pie into 8 wedges.